At least in principle, as consumers and workers get access to unified communiations tools, there is a chance behavior will change. When a user can get a message in one media format and reply in another format, people might start using the tools they like best, and thereby decreasing use of other message formats. Researchers at the Nielsen company, for example, guessed that as people began using social media, they would use less email, for example. To test that thesis, Nielsen broke the online population into four groups. The first three are terciles of social media consumption in minutes, says Jon Gibs, VP, Media Analytics. The fourth is a group that doesn’t use social media at all. Nielsen then looked at each segment’s time of web based email consumption over the course of a year. Finally, Nielsen subtracted the email consumption of those that do not use social media from those that do, basically to show a lift over possible external forces. As it turns out, Nielsen found the opposite of what it guessed it would find. "It actually appears that social media use makes people consume email more, not less, as we had originally assumed, particularly for the highest social media users," says Gibs. In part, that might be because social media sites like Facebook can be set to send messages to user inboxes every time someone comments on a post, depending on user preferences. But it also is likely that high users of social media are, well, "social." They might use any number of media to keep in touch with friends and associates. $350 Billion to Build 100 Mbps Symmetrical Broadband Throughout U.S.
Based on an average cost per dwelling of about $2,700, including capital and operating expense (construction and so forth), the Federal Communications Commission estimates it will take about $350 billion to bring 100 Mbps service to about 111 million to 116 million U.S. homes. 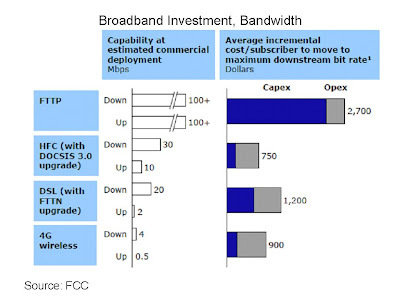 As this chart suggests, there are distinct Internet end user segments, some of which only require moderate bandwidth, others which require more bandwidth, better latency performance and more upstream bandwidth, if not symmetrical bandwidth. The issue for any facilities-based service provider is that the whole network has to be built to accommodate the most advanced users, even if much, or most, of the demand is from less-demanding users. Still, given that such investment must be made, there is increasing room to personalize and tailor broadband access and applications to individual users who actually behave in unique ways. Though the concern expressed by many supporters of strong forms of network neutrality rightly is focused on protecting legal applications from anti-competitive behavior, there clearly are other values that conflict with the proposed solution for discrimination, which is that no bits, from any providers, can be prioritized. In fact, prioritizing bits represents a primary tool for personalizing end user services and applications so that those favored applications are optimized for each user. Surely there are ways to ensure non-discrimination without precluding the creation of personalized services that benefit from end-user specified preferences. 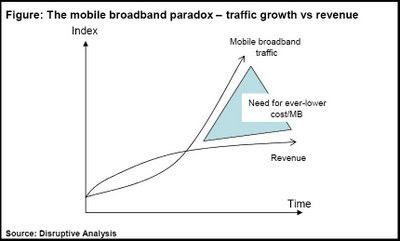 Is Mobile Broadband a Commodity? Most industry observers tend to think and behave as though "voice" were a commodity, and there is some truth to the notion, at least on the wholesale, carrier-to-carrier or carrier-to-enterprise level. I would dispute the notion that voice, in all its permutations, actually fits the definition of a commodity, but for the moment let's look at mobile broadband. Is mobile broadband a commodity? Can it replace a fixed broadband connection. As this chart suggests, the answer largely is "no." A mobile service easily can displace a single consumer voice line or simple Internet applications such as email. But it isn't so clear email access is what people generally mean when thinking about mobile broadband. At the other extreme, high-quality linear entertainment video is virtually impossible to replicate in the mobile domain, so IPTV, for example, has no direction equivalent in the wireless domain. Other applications are somewhere between "mostly" substitutable and "not" substitutable. The point is that a product probably isn't a full "commodity" if full substitution is not possible, or is possible, but without fully interchangeable value. So far, mobile broadband does not seem to be a "commodity" fully capable of replacing a fixed broadband line. There are many reasons, including vastly different speeds, usage caps and pricing. Then there is the demographic element. It is easier to consider substitution when a single-user household is concerned, hardest when multi-member families are concerned. The value of a fixed broadband connection grows with the degree of bandwidth sharing and total number of devices to be supported. One fixed broadband connection might make more sense than five mobile broadband connections, for example. The other angle is that linear multi-channel entertainment video is just a discrete application delivered over a fixed broadband connection, and there is as of yet no mobile substitute. So despite outward appearances, mobile and fixed broadband are not fully-exchangeable substitutes, and hence not true commodities. Lynch's remarks would come as no surprise to anybody who follows revenue-per-bit trends in the broadband access business. It has been clear for some time that, as access bandwidth increases, revenue is not keeping pace. Service providers have some room to deal with the widening gap, by adding new revenue-producing services and applications, managing cost and so forth. But there is not unlimited room to juggle cost elements. At some point, higher bandwidth, which customers want to buy and service providers want to sell, will require investments with a more-linear payback mechanisms. 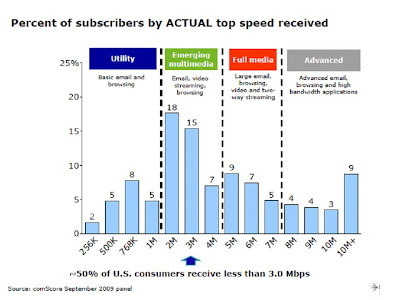 That likely means new ways of pricing bandwidth consumption. That probably doesn't mean a shift to fully-metered usage, as consumers do not like it, and such an approach undoubtedly would depress consumption and therefore stifle new applications and services. But there are lots of other, more-palatable alternatives, namely "buckets" of usage analogous to the ways people now buy voice services or text messaging. Bigger buckets will cost more money; smaller buckets will cost less. And if network neutrality rules are not onerous, service providers might be able to create service tiers with quality of service mechanisms, much as business customers are able to buy, though basic "best effort" plans likely would coexist. “We are going to reach a point where we will sell packages of bytes,” Lynch says. Those packages might also offer differentiated quality of service. Consumption at "off peak" hours might be offered at prices lower than equivalent consumption at peak hours, for example. Whether optional packages could be offered that allow end users to prioritize some applications, as businesses do, will not be clear until after new network neutrality rules are clarified. And that is going to take some time. What will media companies look like in a couple of years? Pretty much what they look like today. But what will they look like in 10 to 15 years? Very different. There are clear reasons why the couple of years will look an awful lot like this year, while a decade from now the whole media business could be structured in very different ways. First, new IP technology and broadband is in place that will drive a long cycle of innovation for challengers and economic destruction for incumbents. That almost assures vast change over a longer time frame. But the emphasis here has to be on "long" cycles. Changes in the media can take quite a long time to mature. Gordon Crawford, The Capital Group managing director, notes that in 1972 the existing media business was quite attractive, financially. But that changed after 1995, the year of the Netscape initial public offering, which ushered in the age of Internet-based media. Only now, 14 years later, is the impact starting to really affect the print segment of the business. And most of the video impact has yet to arrive. Still, Crawford thinks change is inevitable. "If you go out enough years, bandwidth will be there," he says. "Storage will cost nothing and rights issues will be resolved." 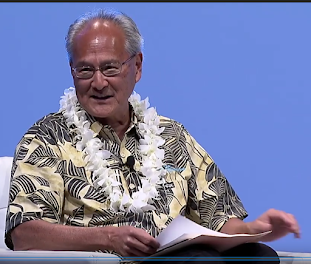 "People will have access to whatever they want, whenever they want it, on any device," says Crawford. "That is where we are going." But one has to remember that large-scale and fundamental technological changes seem to have less impact when the trends are just beginning, but reach some inflection point, beyond which vast change happens relatively quickly. That should not be too different for the video business. There will be less change that you expect early on, and greater change later, in other words. There are some possible outcomes, though. If regulators were, for example, to impose an "a la carte" pricing regime on video providers, 250 of 400 cable channels will disappear overnight," says Crawford. Peter Chernin, former News Corp. president, also agrees that fundamental change is coming. "Non-consumer-friendly business models cannot be supported anymore," he says. "The single biggest question facing the industry is the ability of niche cable channels to survive," says Chernin. "About 60 to70 percent of media profits of big conglomerates come from there." But people only want to watch 10 to 15 channels. "Is that sustainable?" Chernin muses. And while most people think Hollywood ultimately will change its "release windows," that might not have as much effect on what consumers decide to rent or buy as one might think. But there could be big changes in distribution. Chernin thinks the days of people buying DVDs are numbered because of streaming. "The DVD business is declining 15 to 20 percent a year," he says. If networks are ubiquitous, can you convince people to own content for $15 when they can stream it for lots less? Some "70 percent of DVD purchases are for new releases," Chernin notes. Even if the delivery format changes, that is likely to remain the buying pattern. "It’s just a matter of time" before cable networks are faced with "digital destruction," Chernin says. There are obvious implications for satellite, cable and telco multi-channel video providers, of course. The good news is that distributors have some time to get ready for the transition. Being "too early" is about as bad for business as "being too late." Though businesses only buy smart phones for their perceived productivity advantages, a new Compete survey sugggests people mostly use their smart phones for entertainment and other personal applications. That is to say, entertainment, games, music, social networking and weather are the most popular across smart phone platforms. More than anything else, the Compete survey results illustate the changing value proposition, application focus and business models possible in the wireless space. Communication remains fundamental. Email, microblog posts, instant and text messaging are communication formats, first and foremost. But mobiles also are becoming entertainment devices. The survey shows that smart phone owners prefer personal and social apps to business applications. That was not true early on, when a "smart phone" was nearly synonymous with "BlackBerry," and was bought on behalf of business users. While business users remain a key segment of the market, consumer users gradually are becoming the majority of the market. The survey suggests that iPhone owners, more so than other smartphone users, were more likely to spend money on apps., while 83 percent of all smartphone users preferred apps $5 or below. Whether that is because first movers are different than mainstream users, or because the Apple user experience is so much easier, is hard to determine with precision at this point. About 73 percent of Blackberry owners have downloaded five or fewer applications; in contrast, 72 percent of iPhone owners have downloaded 10 or more applications. Clearly, iPhone owners have been more receptive to customizing their devices. Facebook is hot among iPhone owners. About 71 percent of iPhone users report accessing Facebook from their mobile device, and 37 percent listed Facebook as one of their top three most used apps. About 18 percent claim it's their favorite app. Despite Twitter's ever-increasing mobile popularity, 85 percent of smart phone owners still prefer to access the site from the computer. While 26 percent of iPhone users tweet from their device, only 15 percent of Palm owners and 10 percent of Blackberry users report accessing Twitter on the go. Of the smart phone owners who do access Twitter via their phones, 41 percent use the application to keep track of what their friends are doing, 32 percent use the service to keep up with current events and 19 percent tweet from their handset to build a fan base or promote their company. Facebook is the most heavily trafficked social networking site among smartphone owners, says the report, and iPhone users are twice as likely to use the mobile Facebook app as their Palm counterparts. In fact, iPhone owners are the most active mobile social networkers, with the highest percentage of respondents reporting mobile use of Facebook, MySpace and Twitter and from their mobile devices. In Western Europe, the prepaid share of total mobile connections varies significantly by country, but on average it was 57 percent at the end of 2008. Yankee Group is forecasting that figure to decline to 47 percent by 2013. In developing markets, prepaid dominates. For example, in Latin America prepaid accounts for 84 percent of mobile connections today. Yankee Group is predicting this percentage will remain flat during the next five years. In asking the Federal Communications Commission to investigate Google's refusal to terminate some calls placed to high-cost rural areas, AT&T is not simply sparring with Google over network neutrality, but rather pointing up a pricing anomaly that distorts behavior and reduces carrier profits. while suggesting current regulatory rules do not fairly treat competitors in the market, and arguing for narrowing the regulatory differences between VoIP and other carriers and between access, application and content providers, AT&T also is highlighting what it and other carriers say is a pricing distortion in the termination rate regime that directly underpins the businesses of free conference calling services. At immediate issue here is Google's refusal to terminate some calls in high-cost rural areas. Many of you are familiar with free conference calling services that use area codes in rural areas. You might have wondered what the business model is. Simply, it costs carriers enough money to terminate calls in those rural areas that conferencing services can afford to give away the service and make their money on the termination fees. Over the last couple of years other skirmishes have been fought about high termination rates in some rural areas of Iowa and some other areas. Services such as Free Call Planet, freeconferencecall.com and others teamed with Iowa telcos to set up inexpensive or free calling services that generate profits for the providers primarily by collecting millions in access fees. The local telcos provide the Iowa telephone numbers and voice gateways for the services, bill long-distance companies to terminate calls and then pay“marketing fees” to the conference calling services. AT&T said in 2007 that the arrangements were costing it $250 million a year. AT&T, Verizon, Qwest and Sprint Nextel have opposed the "traffic-pumping" schemes, and the Federal Communications Commission did move to limit the practice. Rural phone companies are allowed to charge about 2 cents to 8 cents a minute to connect long-distance and wireless calls to their networks. The fees, up to 100 times higher than rates charged by large local phone companies, are intended to offset the rural companies' high costs and low call volumes. But that's where the arbitrage opportunity arises. Specialty calling services teamed with some rural phone companies to offer free conference calling, adult chat and other services, splitting the call-connection revenues with the rural carriers. The FCC did move to suspend the rural companies' rates. But new providers have set up shop. About 160 million minutes of calls by AT&T customers were routed to rural CLEC networks in March, 2008, surpassing the peak level of calls to rural incumbents, about153 million minutes, in January 2007, AT&T says. Sprint told the FCC that its bill from 11 competitive carriers soared 5,000 percent in 21 months. Recently, even other rural telephone companies have decided they'd better side with the large tier one providers as well, as the practice might damage the wider rural termination regime. Google tariff specialists know that, and apparently want to avoid those costs by restricting termination to such numbers, as the tier one carriers themselves did until forbidden to do so. So aside from the other clear issues about treating like entities in similar fashion, there is the outstanding issue of high termination rates in some jurisdictions. Sometimes numbers can be deceiving. Hitwise data, for example, suggests that Twitter traffic hit a peak in April, and then dropped, peaking again in July before dropping to levels below that of the April peak. In other words, traffic has dropped since April. But one has to make adjustments. A majority of Twitter users use a third-party client to access Twitter. In fact, only about 20 to 30 percent of people go through the Twitter Web site. So the direct Twitter data does not show the full impact of Twitter usage. 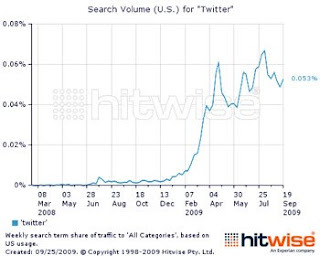 The Hitwise data also suggests the same effect, showing the number of new users--new, not total--coming to Twitter from its top traffic sources, such as Facebook, Google, and MySpace, also has fallen consistently across the board from April to September 2009. But those statistics only point to a slowing rate of growth, and that always happens to any application or service which starts from a low base, no matter how popular. The Twitter Web site does attract about 54 million visitors a month, and that does not count the 70 to 80 percent of users who use the application from a third party portal of some sort. A slowing rate of growth likely is nothing to worry about. Other studies have shown a high abandonment rate for new users, though. In March 2009, for example, more than 60 percent of Twitter users fail to return the following month, says David Martin, Nielsen Online VP. To put that in perspective, it is roughly the equivalent of turning over 100 percent of the user base every three months. Such a churn rate is unsustainable. One suspects the churn rate also will drop over time. People either like it, or they don't. But whether they like it or not, even resisters will use the app if their friends, family and associates do. Ultimately, that is going to make a difference. Back to the Future for Internet Apps? Time spent on social network and blogging sites accounted for 17 percent of all time spent on the Internet in August 2009, nearly triple the percentage of time spent in 2008, says The Nielsen Company. In some ways that is a "back to the future" move, as it was email that drove the dial-up Internet access business. After waves of growth driven by online commerce and then entertainment, it appears communication might again be moving to the forefront. 70% of Mobile Users Planned Mobile Spending Cuts. Have They? 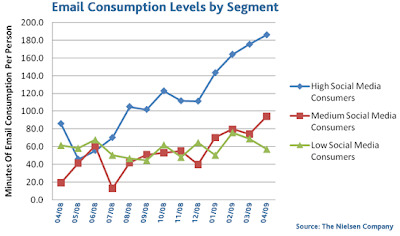 An October 2008 survey by Getjar suggests users were planning significant changes in mobile consumption in response to the recession. It still isn't completely clear whether people actually followed through with action, what adjustments they might have made, or how how much less they might have spent. About 70 percent of mobile phone users who partcipated in the survey suggested they planned to reduce the amount they spend on phone usage. So far, the revenue impact remains hard to quantify, though. A National Park Service official has warned the Bureau of Land Management that approving dozens of solar power plants in southern Nevada could dramatically impact water supplies across the arid region, the New York Times reports. An estimated 63 large-scale solar projects are proposed for BLM lands in the region, and the plants are expected to use a large amount of groundwater to cool and wash solar panels, according to the Feb. 5 memorandum sent by Jon Jarvis, director of the Park Service's Pacific West Region, to BLM's associate state director in Nevada. Jarvis also wrote that the Park Service is concerned that the projects could produce air and light pollution, generate noise and destroy wildlife habitat near three NPS properties: the Devils Hole section of Death Valley National Park, the Lake Mead National Recreation Area and the Mojave National Preserve. "In cases where plans of development have been submitted, the vast majority of these projects propose to use utility-scale, concentrating solar power technologies" that "can be expected to consume larger amounts of water" for cooling than other technologies, Jarvis wrote. "In arid settings, the increased water demand from concentrating solar energy systems employing water-cooled technology could strain limited water resources already under development pressure from urbanization, irrigation expansion, commercial interests and mining," he wrote. As such, the proposed solar plants "potentially face several water-rights related obstacles in obtaining the necessary water for their projects." There always are trade offs in real life. Water-cooled solar farms are no exception. Net Neutrality: Do You Want Random or Planned Blocking? Strong forms of "network neutrality" that allow no prioritizing of Internet traffic pose clear issues for real-time services such as video and voice, at times of peak load. Since all real-time services are highly susceptible to congestion, peak hours may not be optimal times to use them. The problem is that "peak hours" are when users most want those services available. So the issue is simply whether users prefer random disruptions of quality, or planned disruptions of the quality of some applications, in order to provider optimal performance for real-time services. Since no federal rules are going to abolish peak consumption hours, the only practical issue is what methods are used to limit network access at times of peak congestion. One can specify that no packets are blocked or intentionally slowed. But that only shifts the congestion control mechanism. Users will find their voice and video sessions don't work that well, and will restrict their use of those services at times of peak congestion. The other approach is to prioritize applications so the burden of congestion is shifted to lower-priority communications or applications; to users with demonstated "very-high usage" profiles; users who already have exceeded fair usage caps or users at congested cell towers. Some service quality degradation, at peak hours, will happen. The only issue is how the congestion issues are distirbuted. One might argue that congestion effects also could be distributed based on whether users have opted to buy "best effort" usage plans or "assured access" plans. But higher-quality, assured access is not possible when packets cannot be prioritized. Congestion issues, despite network upgrades, always will be a fact of life for networks. The only practical issue is how network degradation is handled. It can be random, or it can be planned. How any new network neutrality rules are framed will determine whether planned mechanisms are allowable. Apple iPhone users likely will be putting strain on the AT&T wireless network today, Sept. 25, 2009,. as multimedia messaging service, which allows iPhone users to send and receive pictures and video, is made available for the first time. But the issue is going to grow in significance. Pyramid Research estimates mobile video usage will grow at a compound annual growth rate of 28 percent over the next five years. By 2014, more than 500 million users worldwide will subscribe to mobile video services, equal to 8.5 percent of all mobile subscription services. That might not seem like much, but video requires about one to two orders of magnitude more bandwidth than voice (10 to 100 times). YouTube says mobile uploads over the last six months have grown 1700 percent. and users have grown 70 percent. The mobile virtual network operator business is headed for growth, and most will come from regions other than North America and Western Europe, says TeleGeography. Globally, growth in wireless subscribers has been driven predominantly by explosive growth in a small number of developing countries, such as China, India, Russia, Brazil, Indonesia, Vietnam and Pakistan. These are countries in which MVNOs are either prohibited or at a nascent stage of development, so the ultimate impact on the MVNO market is not yet clear. 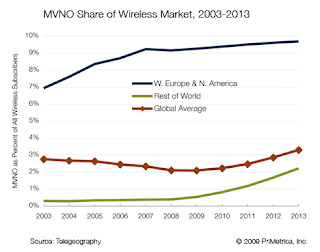 In 2003 MVNOs accounted for seven percent of subscribers in Western Europe and North America. At the end of June 2009 wireless subscribers had grown by almost 60 percent in these two regions to reach 800 million, and MVNOs’ share had increased to over nine percent. In contrast, from 2003 to mid-2009 the number of wireless subscribers in regions other than Western Europe and North America more than quadrupled to reach some 3.5 billion. However, MVNOs have yet to make much impact in these higher growth markets: outside of Western Europe and North America, their share of the market remains less than 0.5 percent. So while MVNOs have been growing strongly in Western Europe and North America, those two regions account for an ever-smaller portion of the world’s wireless subscriber base – it slipped from almost 40 percent to less than 20 percent. That suggests that future MVNO subscriber growth necessarily will come from other regions. In 2003, Western Europe and North America accounted for well over 90 percent of all MVNO subscribers and, despite some growth elsewhere, these two regions still account for over 80 percent of the total. TeleGeography’s latest research predicts that MVNO growth will gain momentum all around the world over the coming five years, as MVNOs are legalized in new countries where they are not allowed at present. Will Net Neutrality Lead to Higher Prices? One can make some reasonable guesses about likely outcomes as the Federal Communications Commission weighs new network neutrality rules. If new proposed rules disallow traffic shaping measures such as slowing peer-to-peer or other traffic at times of peak congestion, the problem of alleviating peak-hour congestion will still have to be dealt with. If the goal is to manage peak traffic load, and service providers cannot shape traffic by slowing some protocols, or slowing all traffic for users who have exceeded their usage caps, then other available mechanisms will be used. And price is one of the most-likely tools. Customers might not like it, but it always is possible to discourage usage by raising prices. And it always is possible to boost usage by lowering prices. And it is wireless plans where the price hikes--or user policing of usage--will be most felt. If usage caps are tightened, consumers will have the option of spending more, or using less. That doesn't mean "unlimited" service packages will disappear. Some customers will want to buy them. But the price of such packages likely is going to rise. For similar reasons, usage-based charging is likely to increase for most other plans as well. That will encourage users to monitor their usage and make choices that will alleviate peak hour strain on networks. As a practical matter, wired network operators already refrain from blocking access to lawful applications, and traffic shaping rules already are tweaked so the policies do not constitute "blocking" or "slowing" of lawful traffic. But wireline operators have more access bandwidth than wireless providers do. So Oppenheimer financial analyst Tim Horan suggests that wireless usage caps will become more stringent. Among other possible strategies is structuring pricing to encourage more usage off-peak, as is the case for voice plans. Application blocking is less an issue than most assume on wired networks, and is a relatively minor irritant for most wireless users, but a significnat irritant for some users on wireless networks. The real trick is how service providers will handle peak hour loading under new conditions where traffic priorities cannot be applied, as typically is the case for many private enterprise networks. One other observation also is in order. As was the case the last time a major change in communications regulation was made, with the Telecom Act of 1996, there will be a period of legal wrangling to test and flesh out the rules. Though most within the communications business would vastly prefer more predictability of business environment, that is not what they are likely to get. Broadband Stimulus Bridge to Nowhere? Since applicants have asked for $28 billion, when the broadband stimulus funds available in the funding round total around $4.3 billion, one already can predict that there will be more entities unhappy than happy about the final awards. Especially unhappy are rural telecom providers who cannot apply because of the definitions used to describe "remote" locations. For that same reason, it might not be rational to look at where proposals are from, on a state-by-state basis, except for purposes of assuring that some funds are disbursed in every state. Nor will it make sense to evaluate proposals based on ubiquity of platform. Mobile or satellite networks might have wide footprints. But there still are places where broadband buying lags the national average. It likely makes more sense to look at proposals at the county level or community level. Even the satellite proposals are specifically targeting a limited number of jurisdications and areas where broadband penetration is low. Some proposals will be better than others. But most of the proposals seem to ask for relatively small amounts of money. That likely is a good sign, as few small organizations can manage a sudden infusion of money and work very efficiently. Some proposals do seem weak on the "cost-benefit" front. But that's why the evaluation process is so important. Reviewers are supposed to sort better proposals from weaker ones. Reviewers likely also know their decisions will come under very-close scrutiny. One therefore can hope for a rational outcome. 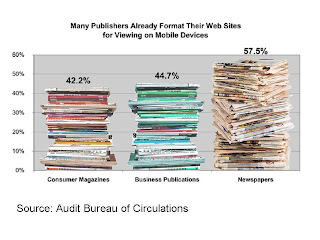 Nearly 52 percent of print executives surveyed by the Audit Bureau of Circulations are distributing or formatting content for viewing on a mobile device. Newspapers are leading the charge, with almost 58 percent already formatting their Web sites for mobile devices. Business and consumer magazines are following closely behind with 45 and 42 percent, respectively. devices as a primary information source in the next three years, the study finds. year than last. Of companies that track mobile impact, 45 percent report that mobility has boosted Web site traffic by up to 10 percent. Half believe mobile traffic to their Web sites will increase by five to 25 percent in the next two years. a smartphone application in the next 24 months, in addition to the 17 percent of respondents who already have an app in production. Nearly a third of respondents believe that mobile will have a significant impact on their publication’s revenue in just three years. What Changes Have Mobile Users Made Because of Recession? 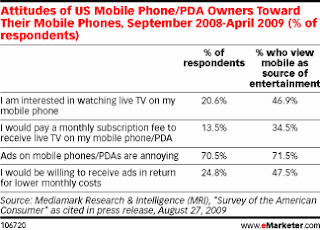 It isn't clear whether users actually followed through with their stated plans and inclinations, but an October 2008 survey by Getjar suggests users were planning significant changes in mobile consumption. So far, we can document the slowdown in replacement phone behavior. Users, at least in Europe, have slowed the pace at which they upgrade their handsets, as 78 percent of respondents to the survey suggested they might. The suggested parsimony on the usage front remains a bit more difficult to quantify. About 76 percent of mobile phone users who partcipated in the survey suggested they planned to reduce the amount they spend on phone usage as well. 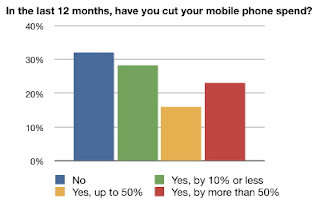 When asked whether they had reduced spending on mobile phones in the last 12 months, more than 50 percent of respondents had not reduced their spending at all, or by as little as 10 percent, during that period. For those people who had reduced their spending, the economy was the reason given by just over one third of respondents, while 20 percent changed their usage habits to lower expenses, and a further 28 percent had switched to using free applications to avoid charges. But the planned reductions could have taken any number of forms. Some 35 percent of respondents said SMS accounted for the greatest proportion of their mobile phone bill. So less texting is one possible user response. So is substituting texting for calling when the tariffs favor such choices. About 18.5 percent said voice services was the biggest cost driver and about 17 percent identified data services as the top usage cost driver. Less calling and less use of data services are other possible responses. 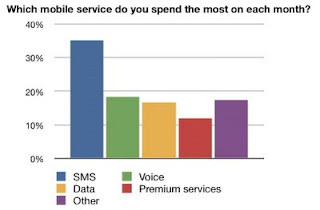 Premium services accounted for the largest part of the monthly mobile spend for 12 percent of the survey participants. For many users, this should have proven the easiest way to reduce spending. This forecast of mobile VoIP, like most forecasts, probably needs to be pushed out "to the right," but is one concrete example of what is likely to happen if the Federal Communications Commission does manage to push through rules applying wired network application non-discrimination rules to the wireless realm. The first thing that will happen is an immediate increase in marketing of mobile VoIP apps. Carriers, of course, can react in ways to shape adoption. For many users, lower calling prices would dampen interest in VoIP over mobile services. Carriers also would have incentive to create their own mobile VoIP offerings, and that might offer them a way to boost data plan sales as well. The most immediate impact of any new wireless non-discrimination rules will be to hasten the day when voice no longer is the key revenue driver for mobile operators. Mobility executives are anything but dumb. They know that day is coming. They just aren't in any hurry to see it. Who Uses "Push to Talk"? Who Wants To? About seven percent of U.S. mobile subscribers use the push-to-talk feature, representing about 18 million subscribers, and most of those users are in a few business verticals, says Compass Intelligence. While 12 percent of respondents to a Compass Intelligence survey currently use PTT, nearly 69 percent indicated no interest in the service, indicating that there is a limited addressable market for this service, Compass Intelligence says. In a 2007 In-Stat survey, for example, PTT was the only category out of six that declined between 2006 and 2007 about 17.5 percent. Researchers argue that text messaging supplies a similar value for many users. In the category of rumors we cannot substantiate, but that the Silicon Valley Business Journal is reporting, Nokia is rumored to be considering buying Palm. It's clear why the deal would make sense. Nokia is the global leader in devices sold, but it lags in the key smart phone category, which is the fastest-growing device category as overall mobile handset sales are slowing. The other angle is that Nokia's entire product line at the moment is based on Symbian. Palm would give Nokia not only a second operating system option, but also an operating system that has gotten favorable reviews for its social networking features and support for use of multiple simultaneous applications. Another angle is that, though dominating global sales, Nokia is a laggard in the U.S. market. Palm would help in that regard. Palm also would benefit from Nokia's global marketing machine, as well. Recently there has been some contraction of support for multiple operating systems. 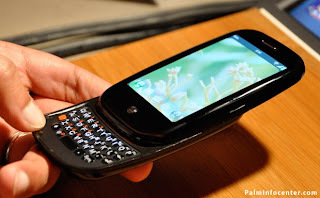 Motorola has decided to support Android, while Palm recently decided to drop its support for Microsoft Mobile. Nokia would be going the other way if it buys Palm. Where's the Payback From Conferencing, Travel? The traditional argument made by communications industry professionals is that conferencing techniques of various types provide a payback by reducing travel costs. But a new study by Oxford Economics suggests the reverse is true. "For every dollar invested in business travel, businesses experience an average $12.50 in increased revenue and $3.80 in new profits," analysts say. One is tempted to argue that the truth lies somewhere in between, given the obvious implications each argument has for each industry's health. Some travel investments boost sales, but some collaboration sessions likely are just as effective using communication tools. 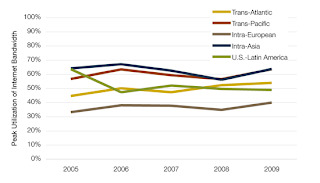 In the first six months of 2009, U.S. business travel is down by 12.5 percent, the study suggests. One suspects that is a conservative figure. The study itself also reports data from a February 2009 survey of 400 corporate executives suggesting that 51 percent have decreased the amount of business travel in recent months. Those who have made cuts have reduced their budgets by an average 35 percent. Roughly 40 percent of prospective customers are converted to new customers with an in-person meeting, compared to 16 percent without such a meeting. More than half of business travelers stated that five percent to 20 percent of a company’s new customers were the result of trade show participation. Executives interviewed cited customer meetings as having the greatest returns, approximately $15-$19.99 per dollar invested, with conference and trade show participation returns ranging from $4-$5.99 per dollar invested. 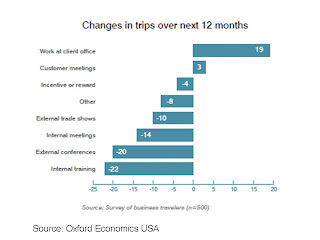 Respondents suggested that customer meetings represent 34 percent of travel budgets, conferences 10 percent, trade shows 10 percent, incentive travel for sales personnel five percent and "other" purposes 42 percent of budgets. One suspects any rational organization therefore would substitute conferencing alternatives for internal meetings, which represent 42 percent of travel spending. Indeed, respondents suggested they would be hiking visits to customer offices by 19 percent, and increasing customer meetings by three percent. In contrast, respondents suggested they would trim travel for internal training by 22 percent, external conferences by 20 percent, internal meetings by 14 percent and external trade shows by 10 percent. Members of Congress have now surpassed corporate CEOs as the least favorably regarded profession in the United States, says Rasmussen Reports. Just 25 percent of Americans have a favor opinion of members of Congress. Of course, shamefully, journalists are viewed favorably by just 43 percent of poll respondents, as are 42 percent of lawyers. Just 41 percent have favorable opinions of stockbrokers and financial analysts. Bankers are viewed favorably by just 48 percent. At the top of the ranking are small business owners, viewed favorably by 94 percent of respondents, and entrepreneurs, viewed favorably by 92 percent of those polled. Pastors and religious leaders are seen favorably by 70 percent of people polled. Is it unreasonable to argue that those of us in any of those professions have seriously damaged our reputations with the general public by sins of commission as well as omission? Is it unreasonable to argue that ethical shortcomings, greed, corruption and even simple unfairmess are widely perceived to infect many professions? And isn't it obvious that only dramatic changes in personal and business behavior can restore levels of trust? Isn't it obvious we are not the people we are supposed to be? Maybe it is time we stop pretending that "somebody else," or "the system" is the problem? Isn't it obvious we are the problem? Most people in these damaged professions actually seem to believe they are behaving ethically, morally and in good faith. Obviously, people do not believe that. Time for change, indeed. Some IP telephony suppliers, as well as many larger system integration companies, focus on the health care vertical. How to pitch IP telephony value to medical vertical buyers isn't so obvious to many retailers, though. But here are seven concrete features medical vertical users might appreciate. Patient screen-pops can be used when a patient calls, providing a dashboard with general demographics, appointments and recent encounter summaries, says Houston Neal, of Software Advice. IP faxing through the IP-PBX can be useful for primary care physicians sending a patient record to a specialist. Appointment reminders that automatically call the patient to remind them of an upcoming appointment or the need to schedule an appointment are other examples. Find me, follow me can be used to prioritize after-hours calls based on the urgency of the situation. Emergencies could be immediately forwarded to 911. Calls from patients that recently had an ambulatory procedure might be forwarded to the physician’s mobile phone. All others might receive voicemail or the answering service. How to assess "urgency" is an issue, of course, but perhaps some combination of user input or recency of content or types of procedures can be part of the algorithm. A patient that recently had surgery likely is a higher priority than a call from a patient who has not had a history of severe or serious illness, or who hasn't been seen very recently. Automated collections messages are a touchy but sometimes necessary business function for any medical practice. Routine authorization of on-going prescriptions might be another application. Patients might call a specific number, then interact with an interactive voice response system to refill a routine prescription. Patient-specific voice messages also are conceivable, allowing existing patients to access customized scripts related to billing, appointments or other information. More use of network-delivered applications (software and applications as a service), more over-the-top VoIP, more mobile VoIP, more over-the-top video services, higher prices and more-stringent usage caps are among the likely new trends if the Federal Communications Commission extends wireline network neutrality rules to wireless companies as well, a move that seems nearly certain as the FCC begins a rulemaking on further network neutrality rules. If traffic-shaping mechanisms cannot be used to manage congestion by selectively slowing some applications on either wired or wireline networks (the FCC already bars this practice on wired networks), service providers might have few tools to regulate use except by raising prices to discourage bandwidth-intensive use. That likely would include a mix of new usage caps and higher prices for users who really want to use video and other bandwidth-intensive applications heavily. What remains unclear is whether any new rules would also restrict the ability to create enhanced tiers of service that a customer wants to buy. For example, a user might want a service that prioritizes his or her own video or voice services over software upgrades or Web surfing. Business users, for example, often can buy services or appliances that allow setting of business priorities. Sometimes those priorities include setting priority for voice traffic from desktop phones instead of Skype, for example. It isn't clear whether "positive" innovations (additional things users can do) will be prohibited by any new rules, as "negative" regulation ("thous shalt not") is put into place. In any case, it is likely that providers of over-the-top applications in the voice, conferencing and multimedia communications areas, not to mention other forms of "software as a service," will be better placed to sell their wares. The issues are quite tricky, though. Though the FCC rules ostensibly are aimed only at ensuring that users have access to all lawful applications, the rules also step over into the realm of business models and permissible marketing innovations. It is not clear that network neutrality allows creation of enhanced services that work by prioritizing applications of any sort, even when that is what the consumer wants, and the service provider wishes to sell. Most observers would agree that it is a proper regulatory effort to allow competing applications and services to have a chance to compete fairly with service and applications owned by the IPS itself. The unknown danger is that laudable efforts to ensure competiton then overstep and retard competition and innovation by prohibiting positive innovation (new things people have the right to do) by prohibiting all forms of application acceleration. About 1-2% of Text Messages Marketing Messages? Some 25 percent of U.S. firms involved in interactive marketing also are using one form or another of mobile techniques, says Neil Strother, Forrester Research analyst. In 2009, about half those firms will have increased their mobile marketing spend. Text messaging likely is a key part of most programs, in part because it reaches nearly every mobile phone. VeriSign, for example, says that in the second quarter of 2009, it delivered a total of 94.8 billion messages across its combined mobile messaging platforms for an overall growth of more than 82 percent from the second quarter of 2008. VeriSign delivered 178.8 billion messages worldwide in the first half of 2009. To put this volume into perspective, it translates to 26 messages for every person in the world (roughly 6.7 billion). The daily average number of messages enabled by VeriSign's combined mobile messaging platforms broke the one billion mark with approximately 1.04 billion messages per day, on average. This represents a 12 percent increase from the previous quarter and an 83 percent rise from the second quarter of 2008. In total, VeriSign delivered 93 billion person-to-person and 1.8 billion application-to-person messages in the second quarter of 2009. As a rough calculation, if one assumes half those messages were "marketing" messages of some sort, while perhaps the other half were "informational" messages not strictly of a marketing nature, then about one percent of all text messages were of the "marketing" sort. If one assumes all the application-to-person messages are business messages--content delivery, reminders, notices and so forth--then a bit less than two percent of all text messages had some direct business purpose. Sprint Chief Executive Dan Hesse says it is fair for the U.S. government to ask whether handset exclusivity deals should have time limits. But he insists that exclusive carrier deals with handset vendors are important for promoting innovation in the industry, according to Reuters. "The legitimate question is how long the exclusivity periods need to be," Hesse says.It's a fair question." Salvatore Tirabassi, a partner at M/C Venture Partners, agrees. Exclusivity does not harm consumers, he argues. "A lot of innovative handsets wouldn't exist without strong carrier partnerships," he argues. There is a lot of risk for manufacturers when new handsets are introduced and the result is that preferential relationships with carrier partners are needed, he says. Also, larger carriers get devices before smaller carriers for logical reasons. "Vendors want volume," he says. "Why do so many vendors work with Costco rather than a smaller retailer?" he rhetorically asks. "If you want to argue that a small carrier in a rural market hasn't benefitted because of iPhone exclusivity, because they can't get it, you have to peel the onion," Tirabassi says. "There are alternatives." Also, for practical reasons, a longer ramp is needed to recover marketing dollars, for either carrier or handset providers, he argues. Exclusivity provides time to recover marketing investments. "Apple, for example, does not want a half committed partner," Tirabassi says. Federal Communications Commission Chairman Julius Genachowski is expected to announce next Monday (Sept. 21, 2009) a proceeding on new "network neutrality" rules that will prevent Internet service providers--both mobile and fixed--from selectively blocking or slowing Web traffic, according to the Wall Street Journal. The FCC currently has four net neutrality principles, which call on ISPs to treat all legal Internet applications equally. That so far has been interpreted to mean no blocking or slowing of traffic based on business considerations such as the origin of the traffic, with some exceptions. ISPs are allowed to filter for spam and viruses, for example. Where matters always have been tricky is where traffic shaping in general is used to maintain reasonable network performance at times of peak congestion. The biggest impact likely will be on wireless networks, which for a variety of reasons have more constraints than wired networks. Initial reporting by the Wall Street Journal, though, suggests the FCC will take those constraints into account. As the rulemaking unfolds, there will be fierce debate over how to further refine the "non-discrimination" rules while still allowing ISPs to manage peak loads on their networks. The shape of final rules will determine how much change might occur for buyers of Internet access services. Prices might rise, new quality-of-service tiers might be introduced, or new packages based on type of dominant applications used might be thinkable where they have not generally been used before. Verizon and other ISPs with fiber-to-home networks might find they have new marketing opportunities, since the networks with the most bandwidth will best be able to avoid any new rules. All we can say for sure is that a new rulemaking appears to be certain. What rules emerge will depend on how well service providers can demonstrate legitmate network management tasks. 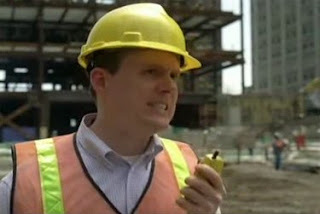 Voice networks, for example, do use "busy hour blocking" algorithms. It appears the FCC does not want any use of blocking as a technique to manage traffic. If so, other mechanisms that either entice users to self regulate, or force them to, will have to be specified. Has Verizon Finally Reached a Key Voice Inflection Point? Verizon Communications might have reached a key inflection point: the time when coping with declining voice lines no longer is among the top sales challenges facing Verizon executives. In fact, in a statement that might still have the power to shock some observers, Seidenberg says video, not voice, will be the core product bought over the FiOS fiber to the home network. Randall Stephenson, AT&T CEO, and Ed Mueller, Qwest Communications CEO, also now are emphasizing that there is a point where landline losses would stop. That doesn't mean, in Verizon's case, that there will be no more line losses from this point forward. In fact, that actual inflection point is nearing, but has not yet been reached. The inflection point now is one of business philosophy and focus, the realization that more is to be gained by growing new businesses aggressively, and using the new platform to reduce legacy costs, rather than focusing on wired voice losses. But neither would it be correct simply to dismiss the notion that there is a time coming when traditional telcos will stop losing voice lines. To be sure, it is a huge change in mindset for a business which has seen voice line losses for nine straight years, beginning in 2000. But it always has been clear those losses would stabilize and then possibly even reverse as competitors reached some natural limit. Nobody with any industry experience ever has argued that cable companies, for example, would take more than a fraction, though a sizable fraction of wired voice lines, for example. And as ultimately most lines in service will be broadband lines, the notion of what a wired access line is, always has been expected to change as well. To the extent that broadband access is the replacement service for wireline voice, while VoIP is an application running over those lines, "voice line loss" will stop in a literal--as well as figurative--sense. The "line" will be the broadband connection. On top of that will run many revenue-generating services, voice and video among them. Given the right balance of features and price, consumers will continue to buy wired voice services, new surveys are starting to suggest. Harris Interactive, for example, recently found that up to 70 percent of consumers would keep using their landline voice services if integrated with their mobiles in some ways. Users very much want the ability to start a mobile conversation using their in-home Wi-Fi networks and keep the connection when leaving the house, and keeping a conversation going--but switching to the Wi-Fi network, when entering the house. Seidenberg says that with TV, the PC and the Internet converging, the carrier’s future would be in selling video services, such as interactive TV, bundled with wireless voice. And Seidenberg's vision of the future clearly includes content services to "all three screens": television, PC and mobile device. Like leading cable companies, which "cluster" in major markets, Verizon also has made a strategic decision to concentrate on higher-density urban and suburban markets, spinning off or selling rural systems without the density to support fiber to the home networks. Aside from allowing Verizon to execute on its new strategy, divesting rural assets also allows the company, which is nearing the end of its fiber upgrade process, to trim its capital spending. Seidenberg also says his job now is to get Verizon Communications focused on the idea that it is going to be a video-focused company providing content and software on three screens. Mobile Capex Not Generating Much of a Return? Policymakers might want to be careful about changing the mobile industry's regulatory framework in ways that jeopardize the revenue any new network investment can generate. The reason? Recent capital investment by communications service providers has proven not to generate much of a return, say analysts at the Yankee Group. commercial services, especially those delivered to small- and medium-sized enterprises, are an increasingly critical imperative for U.S. cable operators. In fact, the revenue and margins delivered by these services will be the main growth engine for the U.S. cable industry over the next few years, say researchers at Pike & Fischer. That itself is change from patterns of the last several years, when broadband access and consumer voice services have driven revenue growth. On the other hand, though mobility revenues have underpinned revenue growth for tier one telcos, video service revenue is the fastest-growing wired service. Separately, the most-recent J.D. Power and Associate study of consumer telephone service marks the third consecutive year that traditional cable television providers have achieved the highest rankings among phone service providers in all regions included in the study. Are U.S. Mobile Service Plans Expensive? Or Affordable? Are U.S. mobile users paying too much? Some data might suggest so. The Organization for Economic Cooperation and Development, for example, suggests that U.S. prices are "high," based on a standard set of usage buckets. But there's a problem. Most U.S. users talk about four times as much as some Europeans do. The problem is that the OECD study uses definitions of "low," "medium" and "high" use that might describe usage in the Netherlands, but are wildly inapplicable to typical U.S. usage rates, says George Ford, Chief Economist of the Phoenix Center for Advanced Legal and Economic Public Policy Studies. Specifically, the OECD analysis calls 44 outbound minutes a month "low," 114 outbound minutes medium and 246 minutes outbound "high" levels of usage. The average mobile consumer in the United States uses 800 minutes a month, about four times as high as the OECD "high usage" level. Furthermore, the OECD considers 55 text messages a month to be "high use" where the typical U.S. mobile user sends or receives 400 text messages a month. Since usage plans are directly related to usage, this is an issue that distorts the comparisons, difficult to make under the best of conditions. By definition, the "average" U.S. user is a "high usage" customer. So if U.S. users kept the same behavior patterns, but had to buy plans as the OECD baskets suggest, they would have to pay rates commensurate with very-high usage levels. In other words, if users in a given country have low usage, and are on low usage plans, then average prices paid will tend to be "lower." In the United States, usage is vastly higher than in Europe. 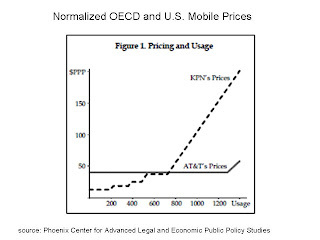 Normalizing for usage volume, what one finds is that U.S. users pay modest prices for much-higher use. If users in the Netherlands had consumption patterns identical to U.S. mobile users, they would pay very-high prices. In other words, one cannot simply compare low-usage plans in one country with high-usage plans in another, any more than one can compare low-usage plans in one country with high-usage plans in the same country. The results are not terribly meaningful. The biggest cell phone service frustration in the United States is the length of service contracts, a new study by the Brookings Institution finds. About 46 percent of those polled say contracts are among the biggest frustrations. What is not clear is how much users are willing to pay for handsets in order to retain freedom to switch providers, though. Roaming charges are an irritant for 20.4 percent of respondents. Other issues that rank among the biggist irritants are the cost of domestic calls, which bothers18.1 percent of respondents, while "lack of features" is an issue for 15.2 percent or those polled. The inability to use devices on other provider networks concerns 14.8 percent of respondents while lack of interoperability is an issue for 12 percent of survey subjects. Americans believe (correctly or not) that innovation is driven by new devices made by Apple and Nokia, and new Internet features pioneered by Google. The most popular new cell phone features are games (named by 61.6 percent), local directories (52.9 percent), music (49.8 percent), and chat and instant messaging (39.8 percent). Consumer concerns are different in other countries where consumers also were polled. In the United Kingdom, the biggest frustration is the cost of international calls (27.8 percent), followed by the cost of domestic calls (25 percent), the length of service contracts (22.7 percent), and roaming charges (22.3 percent). For Spaniards, the greatest frustration is the length of service contract (41.1 percent), cost of domestic calls (40.1 percent), roaming charges (25.6 percent), inability to transfer devices (22.8 percent), and the cost of international calls (21.6 percent). In Japan, the largest problems are the cost of domestic calls (32.3 percent), lack of features (18 percent), lack of interoperability (15.4 percent), length of service contract (14.4 percent), and the slow pace of innovation (14.4 percent). Pollsters asked cell phone consumers in each country about their willingness to pay more money in order to control their cell phone applications. The country with the greatest willingness to pay more is Spain (50 percent), followed by the United Kingdom (35.7 percent), United States (32.9 percent), and Japan (17.2 percent). American consumers were most likely to believe innovation came from new devices (32.7 percent), followed by new Internet-based services (28.6 percent), and new voice services (10.4 percent). Those beliefs may not completely align with the innovation process, but do illustrate the sense consumers have that new devices are key for innovation. To the extent that rapid device turnover actually is directly related to introduction of new services, policymakers would do well to consider how any new mobile regulations might affect the rate and pace of new device propagation. When asked what was most important to improve their use of cell phones, users named getting less expensive service from mobile carriers (55.5 percent) as their top item. A Microsoft-commissioned study conducted by Forrester Research suggests that worker mobility and office decentralization will become key issues for the enterprise and small- to medium-sized businesses in coming years, as worker mobility increases. The report, "The Costs and Challenges Associated With Supporting Today's Informational Workers," suggests that mobile PCs will constitute some 43 percent of corporate PCs by 2012, an 11 percent increase over the current situation. That also suggests the number of desktop PCs will decline to 57 percent in three years’ time, down from 68 percent today. The report found that only 30 percent of firms were highly centralized in “one or a few offices,” though that number was expected to increase marginally to 34 percent by 2012. About 20 percent of tweets contain requests for product information or responses to the requests, according to Jim Jansen, associate professor of information science and technology in the College of Information Sciences and Technology at Penn State. "People are using tweets to express their reaction, both positive and negative, as they engage with these products and services," said Jansen. "Tweets are about as close as one can get to the customer point of purchase for products and services." Also, while many marketers worry about what people may say about their firms, "a lot of the brand comments were positive," Jansen says. Jansen, along with IST doctoral student Mimi Zhang, undergraduate student Kate Sobel and Twitter chief scientist Abdur Chowdhury, investigated micro-communicating as an electronic word-of-mouth medium, using Twitter as the platform. Their results were published in the Journal of the American Society for Information Sciences and Technology. The researchers examined half a million tweets during the study. The team looked for tweets mentioning a brand and why the brand was mentioned -- to inform others, express a view on the brand or something else -- and found that people were using tweets to connect with the products. "Businesses use micro-communication for brand awareness, brand knowledge and customer relationship," say Jansen. And though some are uncertain about Twitter's enduring value, Jansen sees Twitter succeeding, because people and businesses are starting to make profits from it, using it as a creative way to market their products. "It may be right up there with email in terms of its communication impact," Jansen also argues. Verizon Communications has moved to block a planned $900 million sale of Nortel Network Corp.'s Government Solutions group and DiamondWare Ltd., a Nortel-owned maker of softphones, to Avaya Inc., arguing there will be "serious consequences to safety, welfare and security" because of feared disruption of U.S. government and military communications networks and emergency systems across the United States and Canada. The dispute--which has a major customer objecting to practices of a major supplier, appears in part to be a contract dispute. Avaya of course says it intends to honor all existing Nortel contracts, but Verizon and Avaya apparently have not been able to agreement in language that suits Verizon. An outstanding patent infringement lawsuit against Verizon in Texas, slated for trial next year, appears to be an issue. Avaya appears to believe Nortel might face some liability, and doesn't want to take over Nortel's "highly contingent" liability in the patent case. If Avaya buys Nortel's business and leaves Verizon's contracts behind, Verizon will have only a few months to get a new source of equipment, software, maintenance and support for systems that are at the heart of U.S. emergency response, anti-terrorism and national defense systems, Verizon argues. MetroPCS Communications, a leading provider of unlimited prepaid wireless communications service will launch Long Term Evolution 4G mobile broadband services in the second half of 2010. Ericsson will provide infrastructure while Samsung Telecommunications America will provide the company's initial LTE handsets. The network upgrade likely will have wider implications for consumers using other service providers as well, as MetroPCS likely will offer more affordable mobile broadband prices and packaging than have been available to date, from tier one and other providers. As MetroPCS has made a market largely on users who are substituting mobile service for landline, one suspects the firm might be tempted to try the same thing for broadband access. As MetroPCS uses the CDMA air interface for voice and text services, it will introduce dual-mode LTE/CDMA devices as part of the plan. MetroPCS has been a price leader in the prepaid space, and the new capabilities likely will put pressure on the tier one carriers to lower their mobile broadband tariffs further. One wonders whether the tier one providers might not also, as part of that shift, create differentiated mobile broadband tiers that are quite a bit more "application specific," or at least tailored in key ways to the usage profiles different users have. Business users have different requirements in the reliability area than casual consumer users. Heavy users of mobile video will require more bandwidth, but might also be offered heavy-usage plans at a higher price. The challenge is to balance simplicity with consumption. The problem right now is that few mobile users have any idea how much bandwidth they consume and for which applications. That means consumers will have a hard time figuring out which plans they ought to buy. Providers, on the other hand, might need to work on their billing and operations processes so they can flexibly track usage, make that information available to end users, and then create differentiated plans tailored to actual end user behavior. It isn't yet clear what packaging innovations MetroPCS might be willing to introduce. But it has long positioned itself in several clear market segments, including users who can replace wired telephone service with a mobile, especially users with low needs for mobile support outside of the home market. 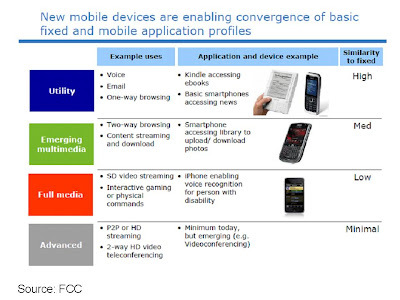 Its mobile broadband efforts are likely to build on that profile. Telstra, Australia's incumbent communications service provider, has been given an ultimatum by the Australian government: either cease to be both an owner of and service provider or face forced functional separation. If it does not act voluntarily to break itself up into two new companies--one providing wholesale access to all retailers while the second firm is limited to retail operations, Telstra will be forced by a proposed law to do so by government edict. Communication Minister Stephen Conroy has introduced legislation that, if implemented, will separate Telstra's network operations from its retail sales and marketing. According to the proposed legislation, Telstra will have two choices about the structural separation. It can create a new company and transfer its fixed-line assets to that company, or it can move its fixed-line traffic to the new national broadband network and scrap its existing access network. Telstra, in other words, would have to strand 100 percent of its access assets. If Telstra does not agree to voluntary structural separation the bill provides for forced functional separation. Under the forced separation plan, Telstra would be required to conduct its network operations and wholesale functions at arm's length from the rest of the company; provide the same information and access to regulated services on equivalent price and non-price terms to its retail business and to non-Telstra wholesale customers; and put in place and maintain strong internal governance structures that provide transparency for the regulator and access seekers that equivalence arrangements are effective. The good news for mobile service providers: according to data from Mediamark Research & Intelligence, more than one-fifth of US mobile phone or PDA users are interested in watching live TV on their mobile device. The bad news: Only 13.5 percent of all respondents said they would pay a subscription fee for mobile TV, and even among respondents who said mobile was a source of entertainment, the figure was just 34.5 percent. The best news: people once scoffed at the very notion of consumers paying for TV, but that belief has been proven dramatically wrong. Most U.S. consumers get their TV from a satellite, cable or telco video provider. The challenge: differentiated programming not available on broadcast networks was what drove the interest. Simply making existing content available on mobile networks might not move the needle much. The current thinking by distributors is that making mobile video a feature available to fixed line video services is one way to drive business value from mobile video. That is helpful to an extent, but doesn't address the more fundamental problem, which is that video will put an order of magnitude or two greater strain on mobile networks, largely without benefit of revenue lift to compensate for the required network investment. If a business--any business--faces a magnitude or two of incremental cost, it stands to reason that those costs simply must be covered, one way or the other. If advertising is insufficient--and it clearly will be--then paid viewing or higher direct bandwidth charges are the most-likely revenue generators. Broadband Internet access grew the fastest of a range of 10 video, voice and other consumer services in the second quarter of 2009, an analysis by Silicon Alley Insider suggests. About 3.3 million more net new broadband subscribers were added in the second quarter of 2009, compared to the same quarter of 2008. 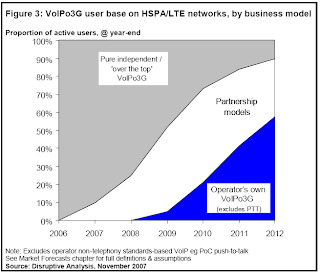 VoIP subscribers also grew, adding 2.5 million cable subs. Overall, though, video services added twice as many subs as did broadband Internet access or VoIP services, among the 10 services tracked. Internet Displaces Newspapers, TV Next? More people now get their news from the Internet than from newspapers, the Pew Research Center for the People & the Press reports. The percentage of people who say they get most of their international and national news from TV has been dropping slowly. But the vast majority of Americans (71 percent) continue to cite television as their source for most national and international news, and there is yet no dramatic shift on the order of what has happened to newspapers. Not many would bet against that state of affairs continuing forever. The bigger question seems to be over timing: How long will it be before something like the 2005 inflection point for newspapers occurs? The newspaper experience suggests the change, whenever it happens, will be abrupt. There seems to have been some significant shift of user behavior around 2005 that caused an sudden shift in market share for newspapers. Since 1999, the percentage of people who report getting their international and national news from television has fallen from about 82 percent to 71 percent. 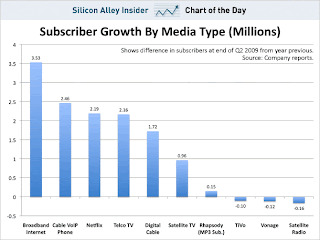 What the chart does not capture is the shift of TV news from "broadcast" to "cable news," though. While 42 percent of Americans rely on the internet for national and international news, just 17 percent say the Internet is their main source of local news. Americans are about equally likely to say radio is their main source for national and international news (21 percent) and local news (18 percent). While 70 percent of those younger than 30 say they get most of their national and international news from television, nearly as many (64 percent) point to the Internet. Among those ages 30 to 49 a similar pattern is evident; 62 percent get most national and international news from television, while 54 percent cite the Internet. As you might expect, less-developed handset features make ease of mobile Web navigation a key issue for feature phone owners, while smart phone owners are less concerned. That said, speed of page loading is the top issue for both smart phone and feature phone users. On the heels of a study that suggests less ad engagement with mobile advertising by smart phone users, another study suggests nearly-identical levels of engagement with Internet activities. The studies do not contradict each other, but merely suggest that high levels of engagement with mobile content do not necessarily lead to high levels of engagement with mobile ads. A study by Chitika, a Massachusetts-based online advertising network, suggests mobile users are approximately half as likely to click on an advertisement as non-mobile users. The findings are based on a sample of 92 million impressions. The new InsightExpress study found that 68 percent of smartphone users reported feeling positively engaged while using the mobile Internet, second only to the 70 percent of users who were positively engaged while on a computer. Only 47 percent of feature phone users reported positive mobile site engagement, as you might expect, given the more-limited capabilities of feature phones, compared to smart phones. These results indicate that smartphone users are as engaged with mobile Internet content as those who are browsing the Internet on their computer. The Chitika results suggest that, for any number of reasons, mobile advertising is not yet optimized. When mobile Internet users were asked to identify the top three elements that most influence their decision to return to a mobile Internet site, they said the top three issues were the speed at which the site loads, the ease of navigation on the site and the quality of the content on the site itself. Service providers largely control the first variable, site designers and handset manufacturers the second variable and content providers the third. Among mobile Internet users, several small but telling differences were revealed when comparing smart phone owners to feature phone owners. While both groups prioritized the speed at which a mobile site loads, smart phone users looked next at the quality of the content, ranking ease of navigation as less important. In contrast, feature phone users found ease of navigation almost as essential as their number one concern, how fast the mobile site loads. These differences can be explained by the limited navigation capabilities available with feature phones, making simple interfaces an absolute necessity. Smart phones, with their advanced browsers and inputs, allow for more complex page navigation. Mobile Web site features that had the least impact on a users decision to make a return visit were the absence of advertising, the ability to personalize, and the number of links, videos or images on the site. Leading companies have stepped up their emphasis and focus on marketing accountability practices, according to a new survey by the Association of National Advertisers and Marketing Management Analytics. About 75 percent of respondents reported a decrease in their marketing budget in 2009 while 67 percent said they were expected to drive more sales with the same or lower budget. Fully 92 percent of respondents said they are taking steps to improve marketing effectiveness without spending more in 2009. That is leading to a shift of spending away from legacy channels and towards digital media, as 70 percent of respondents indicated they are doing so. Respondents say their firms also are shifting advertising investment from brand-building initiatives to promotional marketing. About 53 percent of respondents indicated their firms are doing so. Firms also are shifting their spending to lower-cost media. This means use of local instead of national TV ad buys, or 15-second instead of 30-second ad buys. About 38 percent of respondents said they were taking such measures. Another direct result is greater emphasis on accountability and more collaboration across marketing, finance and research teams. Some 32 percent of respondents said their teams included representation from marketing, finance and research, up from 22 percent in 2008. About 17 percent of respondents said they use "what if" scenarios, up from eight percent in 2008. Some 43 percent of respondents also said they use customer lifetime value models as an accountability technique, up from 27 percent in the prior year's study. Avaya is acquiring Nortel Enterprise Solutions for $900 million in proceeds to Nortel and an additional pool of $15 million reserved for an employee retention program. The deal vaults Avaya clearly into the number one position in the enterprise telephony market, with a combined market share of 25 percent. Cisco, after battling Avaya for years for enterprise telephony leadership, now finds itself number two with 16 percent in market share, and facing a significantly more challenging competitor with the combined Avaya-Nortel, says the Yankee Group. To the extent that the "unified communications" market overlaps directly with the "business phone system" market, the deal also affects market shares for unified communications solutions as well. Few things in life are as dependable as annual increases in Internet traffic globally. 2009 has been no exception, in that regard. So far this year, global bandwidth consumption is up 79 percent, higher than the annual increases of about 60 percent in most prior recent years, according to TeleGeography. Mobile Users Less Likely to Click on Ads? MetroPCS, Leap Wireless in Play? Gmail User Engagement Seems Higher: Why? What Makes a Business "Social"? Shocking Change in Video Behavior? Mobile Video the Next Big Thing?